This weekend’s Reviewpocalypse continues with two masks that I purchased on a whim, from a brand I’ve never tried before. SNP stands for Shining Nature Purity, and I first became aware of the brand when the always lovely Fraulein Schnee reviewed the SNP Bird’s Nest Eye Patch on Berries in the Snow. I kept her review and my positive impression of the brand at the back of my mind. Then, during one of my “bored of my stash and need new things to try” Memebox sprees, I came across a la carte singles of their Bird’s Nest Aqua and Diamond Brightening Ampoule sheet masks and jumped at the opportunity to try them. First, a word about what the two masks have in common: the mask sheets! I’ve talked before about how important the mask sheet material is to my overall sheet mask experience, for better or for worse. I’m super happy to report that the material SNP uses for these sheet masks is among the best. Made out of a nice cotton weave that’s neither too thin to hold much essence nor too thick to fit and conform to my face comfortably, the sheets adhere nicely to my features and are highly saturated with essence. I was able to wear both of these masks (not at the same time!) for upwards of 50 minutes without them drying out. The mask sheet material gets us off to a great start! When and how to use: After cleansing and toning but before the moisturizer step(s) in your skincare routine, tear open mask packet, remove and unfold mask, and apply to face. Smooth out any air bubbles so that the material hugs your skin closely. Wear for 10-20 minutes as directed on the package, or longer if you choose. After removing, pat in any remaining essence and seal in the hydration with an emulsion, gel, or cream moisturizer. Purpose: The SNP Bird’s Nest Aqua Ampoule Mask is marketed as a nourishing, reparative, and protective treatment for tired or aging skin. SNP has a serious fetish for shiny shiny boxes, as you’ll soon see. Do not use if: You are sensitive to alcohol, witch hazel, or anything else in the ingredients list. CosDNA analysis of the ingredients list only turns up two minor flags, both for common ingredients typically used in very small quantities. And there is the company address if you would like to go to Seoul and stalk them. Notable ingredients: One thing I appreciate about SNP’s sheet masks is that they disclose the exact quantity of the featured ingredients in their masks. The Bird’s Nest Aqua Ampoule Mask contains 1,000 mg of swiftlet nest extract, which is widely used in traditional Chinese medicine for anti-aging purposes. When applied topically, swiftlet nest extract may be highly nourishing. Like snail mucin, plant or mammalian placenta, and other similar ingredients, it is a compound of many different vitamins, minerals, and moisturizing agents with traditionally and anecdotally reported benefit to the complexion. These masks also contain centella asiatica and camellia sinensis leaf extract to soothe irritation and reduce redness and balance out the hydrating sodium hyaluronate with the occlusive ceramide 3. Um, “flavor” refers to fragrance, I imagine. I got a drip of this mask’s essence in my mouth and I can definitely say that the “flavor” is terrible. Sorry for the glare. It’s just so SHINY. My second impression of this mask, after my pleasure at the excellent mask sheet material, was not a positive one. 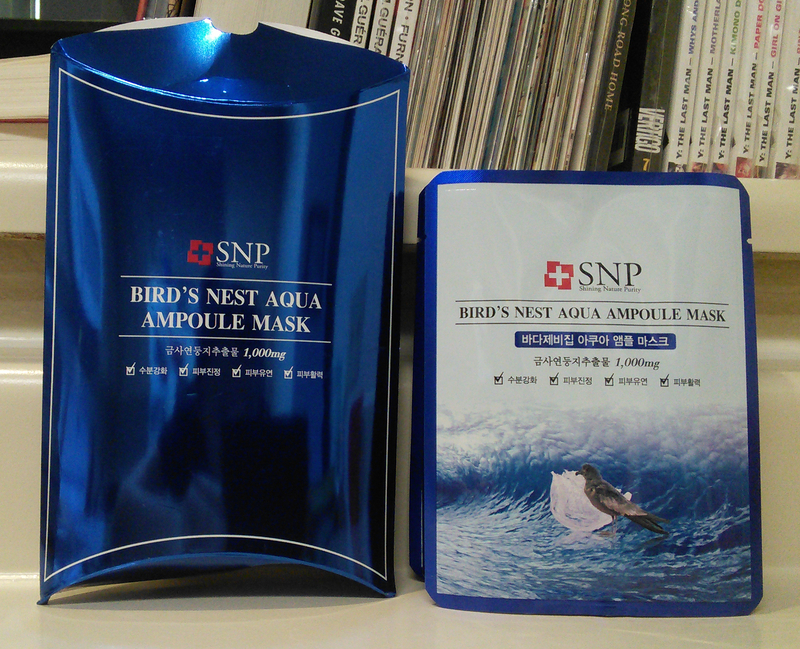 The SNP Bird’s Nest Aqua Ampoule Mask is extremely perfumey. We’re talking “do not use if you feel a headache coming on” perfumey. For the first ten minutes or so with this mask on, the fragrance is nearly overpowering, and I almost took it off prematurely because I couldn’t stand the smell anymore. Fortunately for me, the fragrance does simmer down after about ten minutes. In the end, I was able to wear this mask for a good 50 minutes or so, and that was a good thing, as I was able to enjoy the full benefits of the mask’s ingredients. SNP Bird’s Nest Aqua Ampoule Mask has truly remarkable brightening, soothing, and hydrating effects. It evens out my skin tone and dramatically reduces redness. After I used up my first one, I went and got a box of 10 of them and found myself reaching for them very frequently. Considering the size and scope of my mask stash, any mask that can make me go back to it over and over should be considered a great mask. Conclusion: If not for the strong fragrance, I would consider these masks close to always-stock status. As it is, I eventually decided to destash my remaining stock of these masks and return to My Beauty Diary for my bird’s nest needs, since the MBD masks lack the overpowering fragrance of the SNP. Despite this flaw, however, they are still really excellent masks that deliver lovely effects. SNP Bird’s Nest Aqua Ampoule Masks are available for $2.20 apiece at Memebox, for $18.10 for a box of 10 on Amazon (affiliate link) with free Prime two-day shipping, or for $9.38 for a box of 10 at RoseRoseShop if you’re willing to wait on the international shipping. As much as I liked these masks and wanted to like them even more, I found that I fared a little better with the other variety I tried. Purpose: The SNP Diamond Brightening Ampoule Mask is marketed as an intensive hydrating and brightening mask. Could these BE any shinier? Do not use if: You are sensitive to niacinamide, alcohol, or anything else in the ingredients list. Diamond powder, really? Does a sheet mask really need bling? Like the SNP Bird’s Nest Aqua Ampoule Mask, the SNP Diamond Brightening Ampoule Mask’s CosDNA profile is fairly clean. Notable ingredients: I am thoroughly “meh” about the inclusion of diamond powder in this mask, which to me comes off as incredibly gimmicky. SNP isn’t the first cosmetics company to add actual jewelry to their products in order to give a luxurious impression, nor will SNP be the last, but I’m not drawn to that kind of thing at all. Generally, ground-up fine gems in skincare products are little more than a way to charge more for the products without having to produce more in results. I’m much more interested in the 1,000 mg of sodium hyaluronate and the niacinamide in this serum (and not interested at all in the fractions of a drop of extracts that appear after the diamond powder). The niacinamide is an especially promising ingredient here. Its anti-inflammatory abilities should help to reduce redness and even out skin tone immediately after use, while its long-term melanin-inhibiting function will help deliver real dark spot reduction results if these masks are used frequently and consistently for an extended period of time. You’ll note that besides the diamond powder and niacinamide, there don’t seem to be any other ingredients of real note here, at least not any ingredients that appear in substantive quantities. And that’s okay, because sometimes all it takes is a fairly basic and unexciting formulation to produce results that are anything but unexciting. 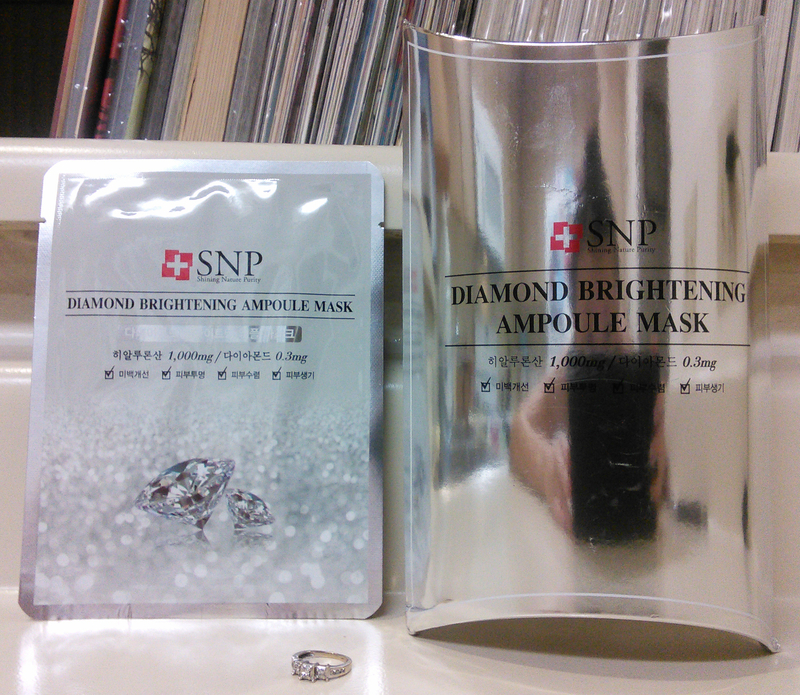 I was thoroughly impressed by the SNP Diamond Brightening Ampoule Mask’s ability to calm and soothe my skin. Its effects on a couple of lingering red spots I’d acquired after healing up a recent product breakout (those spots, by the way, are called PIE, which stands for Post-Inflammatory Erythema) were especially notable. The spots shrank and faded visibly and continued to diminish after I took off this mask, instead of coming back the next morning. The calming powers of the mask produced an intense brightening effect, and my skin felt plumped and hydrated. Oh, and the fragrance? 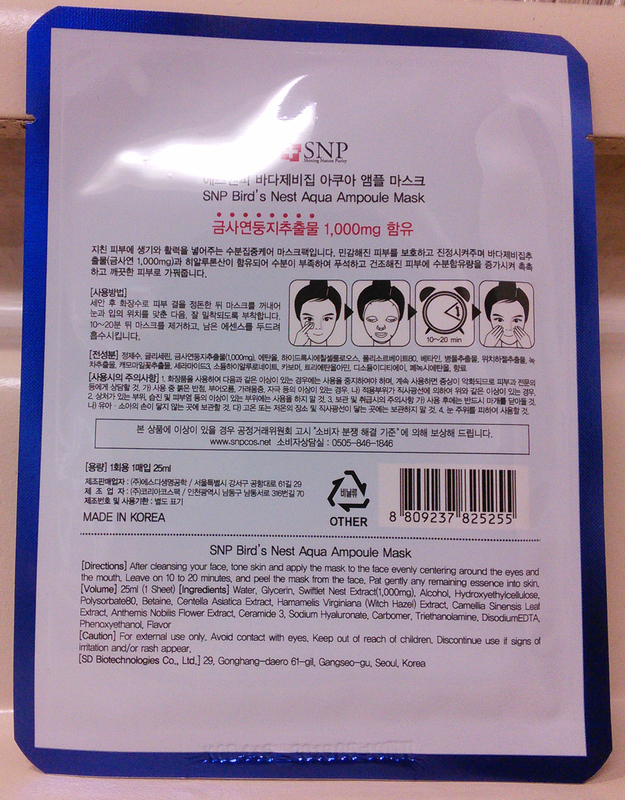 SNP Diamond Brightening Ampoule masks smell very faintly of pineapple–very faintly. The smell (“flavor”) isn’t at all an issue with these masks. Conclusion: Thanks to the strong brightening and hydrating effects and the lack of overwhelming fragrance, SNP Diamond Brightening Ampoule masks have earned a spot in my always-stock list. I happily bought a box of 10 of these masks after seeing the results of the first one I tried and have already gone through a few of those masks. SNP Diamond Brightening Ampoule Masks are available individually at Memebox for $2.20 apiece and on Amazon for $19.70 for a pack of 10 (affiliate link) with free Prime two-day shipping. Have you tried any masks you like lately? I’m just getting a basic routine together right now. So, I haven’t tried sheet masks yet but I’m adding this one to my mental list of things to try. Ooh and have you tried the Innisfree second skin masks? They seem… interesting. I actually tried SNP bird’s nest cream from one of my memeboxes and yeah…I gagged at the scent the first several times I used it. I think it must have damaged my nose because now I don’t even notice a scent lol. Not one that I think that I will ever purchase again, though it isn’t bad. It actually seems to do a decent job of getting my skin to retain moisture. I really like the SNP Bird’s Nest eye patches and the Diamond sleeping pack! I haven’t tried these masks though, I might just need to now. I have yet to try these! I’m always in the market for a new eye mask. I have permanent panda eyes that just won’t go away! What I still really love about the SNP Bird’s Nest Hydrogel Patches is the visible brightening and hydrating effect. Istarted to use the patches every morning under my eyes and around my smilelines and the areas just feel and looks so much better. A pitty the bird’s nest mask is too strongly scented for you. I didn’t try it yet, but I really would be curious to know if it has the same scent of the eye patches. Sounds intriguing…but curious about how the swiftlets nest extract is actually….extracted. Are they discarded nests or what?? Not sure how i feel about the poor swifts nest building only for us to be destroyed to go on my face! I’m a huge fan of the OG Innisfree It’s Real Squeeze masks in general – aloe is my favourite (sheet mask/ingredient in general, it would seem ;D), also loving the bamboo & pomegranate varieties. MBD Hyaluronic Acid Hydrating Masks are my go-to for instant plumping & moisture = perfect pre-party face every time! Isn’t it amazing the difference some plumping can make? You should try out the MBD Platinum Hyaluronic Acid masks sometime. They’re super thin and ready to take off after about 30 minutes, and the plumping is out of this world! I’m new to bird nest as skin care! Love your review.